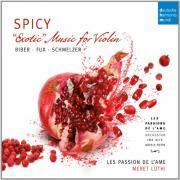 Musical exoticism from Biber et al on suitable fiddles ‘Austrian baroque music, spiced with oriental exoticness, virtuosity, scordatura, programmatic approaches, dulcimer & percussion, played on violins by Jacobus Stainer.’ I quote the cover of this CD because for once it tells you pretty much what you need to know. Here are two old descriptive favourites of this repertoire – Johann Schmelzer’s Fencing School and the raucous bestiary that is Biber’s Sonata representativa – along with two ‘Partias’ from Biber’s collection of retuned trio sonatas Harmonia artificiosa-ariosa and two Turkish excursions: Turcaria by Fux and a battle piece for Viennese and Turks by Schmelzer’s son Andreas Anton (well, maybe: bizarrely it’s actually an adaptation of ‘The Crucifixion’ from Biber’s Rosary Sonatas). The Stainer violins sound great, as well they might since Stainer was Biber’s own maker of choice. Indeed, it is almost as if having them in their hands has spurred Meret Lüthi and her companions to ever greater freedom, for they make a mighty, fruity sound, deliver as boisterous an opening to the Schmelzer as I have heard and cut loose with excitable virtuosity in the Biber pieces. And what was that about ‘dulcimer & percussion’? Prompted presumably by the fact that the Ottomans were practically knocking on Vienna’s gates at the time, Les Passions de l’Ame have added Turkish percussion and a dulcimer’s silky ring and ping to much of it. They do so with no less vitality and joy than they brought to their string-playing; whatever you may think of it, the almost orchestral roar of the Fux will not leave you unmoved. There are times when they could tone things down a little – it does feel like there are just too many continuo instruments sometimes – but frankly I’m finding this thrilling debut disc pretty hard to resist.